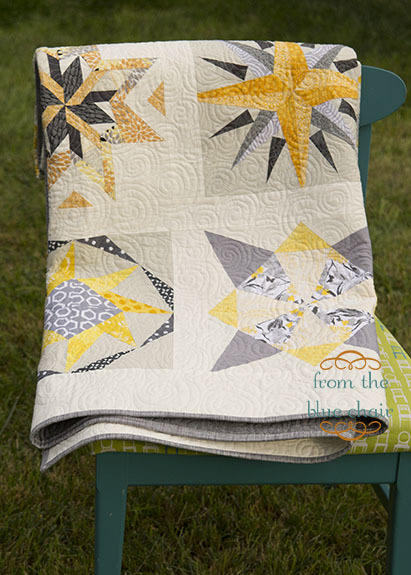 from the blue chair: Stars Quilt--Finished! 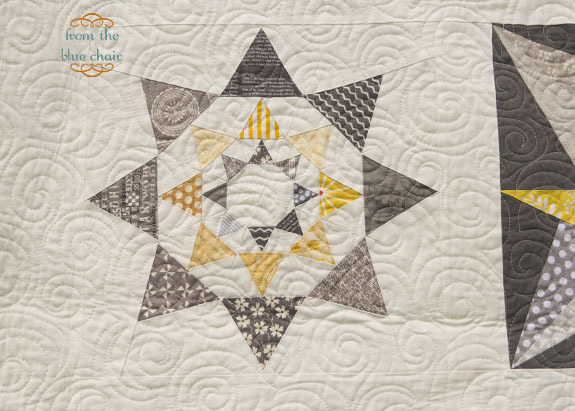 More than 20 amazing quilters contributed blocks to this quilt! I participated in two different quilt bees last year. Both groups sent blocks for this quilt. 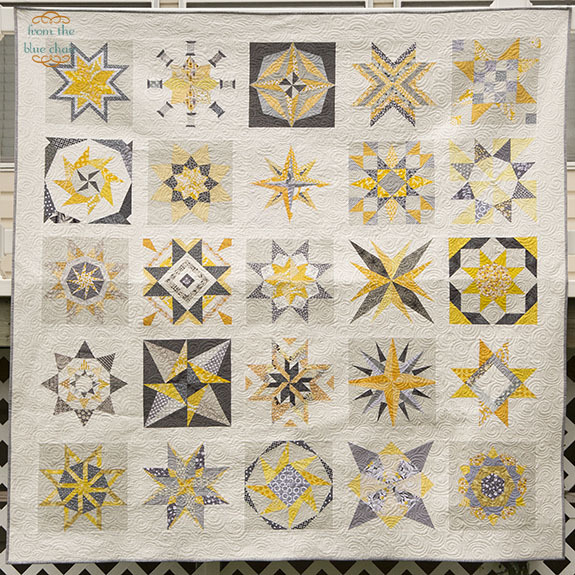 I requested they make a 12" paper-pieced star block using yellows and grays. One bee group used their own stash. I sent fabric out to the other group. I admit when I received all the blocks back, I just wasn't feeling this quilt. I struggled with how I wanted to put it together and how all the blocks would work together. They went in a box for almost a year. I'd occasionally pull them out and give it a try, but nothing clicked for me until last month. I decided to make a few extra blocks so I could do a 5x5 layout rather than 4x5 that I originally planned. I posted a pic on Instagram requesting ideas. One person suggested making a few blocks with dark grey backgrounds to make them stand out. I'm so grateful for that comment because those few darker blocks really pop and make a huge difference in this design. Final dimensions are 76" x 76". The blocks are 12" finished. Sashing is 2" finished, and the outer border is 4" finished. I quilted an all-over swirl. I wanted the quilting to tie the blocks together rather than emphasize the differences. 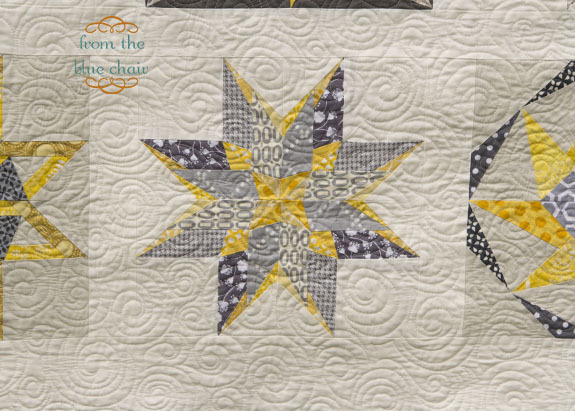 Originally, I was thinking of trying to do some type of custom quilting on each different star. I knew there were two problems with that. First, I didn't feel my quilting skills were up to the task. Second, I worried that it would divide the quilt and make it look disjointed. Unlike my normal style, I chose a very simple back. I pieced just one block in with 4 yards of yarn-dyed essex in black. I have no specific plans for this one as of yet, but it's nice to have another quilt off the WIP list. Yes! I've been waiting to see this finished up after you Instagram peeks. It looks fantastic, and I'm proud to see my little compass block in there! it's lovely! those colors are great. You don't have a plan for this quilt?? I know, you can send it to me! ;^) It's really beautiful. Thanks for the tips you used on this quilt. It really turned out beautiful Kati! I love the colors, and the blocks are all amazing. 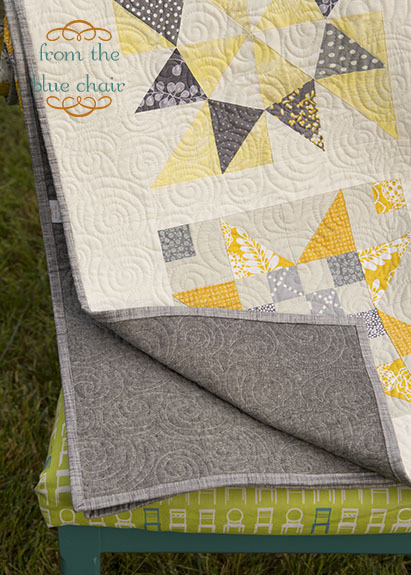 This is a beautiful quilt and grey and yellow are not even my favorite colors, you made this one stand out! This is a really beautiful quilt. 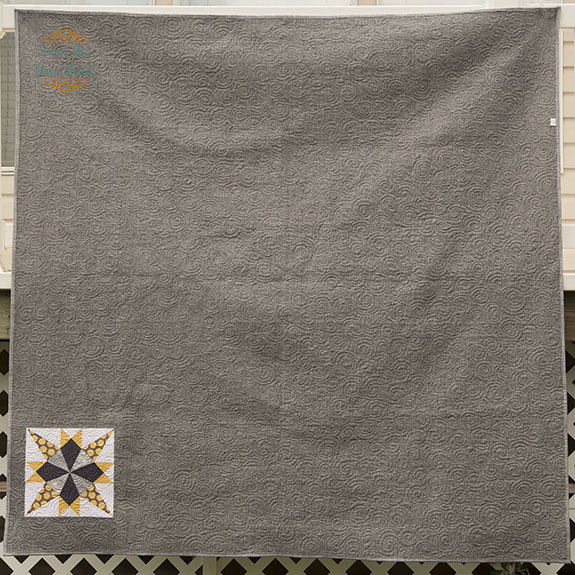 I think the overall quilting pattern was the right choice, and I bet the back is really lovely to run your hand over with the reasonably dense quilting and the linen. Fabulous quilt - congrats on a beautiful finish! 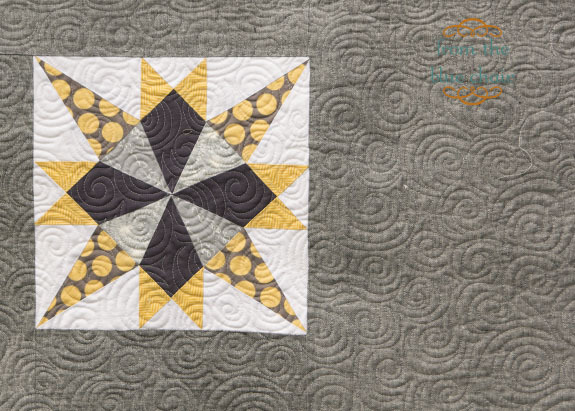 Love the blocks w/ added dark background and think the swirl quilting fits it nicely! Each block is beautiful! Great job! Beautiful. This is your best one yet I think. :) If I could afford it I would beg to buy it. So beautiful!! Love the color way and the swirls. It turned out really beautiful....I agree with you on those dark grey blocks, they really do it. This quilt turned out amazingly gorgeous! Those dark block add a really nice focal point without distracting from the other lovely stars. It's gorgeous, Kati! 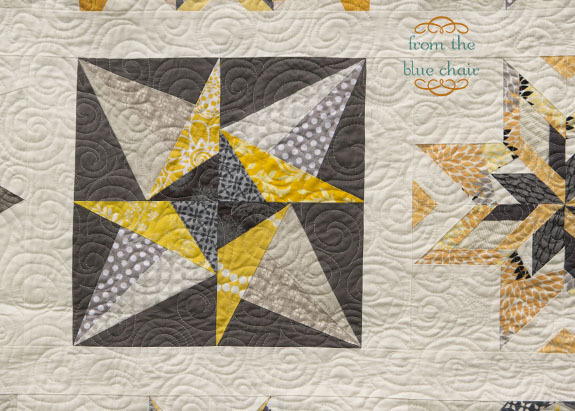 I love all the different star blocks and the different shades of gray. I spotted my block! :) It turned out beautifully, Kati! Congrats on a gorgeous finish! It's beautiful Kati! You did such a great job putting them all together! Love the dark background blocks; great idea! Totally glorious! All so even in quality, without it looking too planned. I bet everyone is loving spying their blocks! This quilt is wonderful and the quilting was a perfect choice. You arei right - it really unifies the blocks. Looks great! I like the colours and the stars. The quilting really fits.